← Can you just set your electronics aside? My daughter, Hilary, turned 25 this weekend, and when it’s the birth day of one of your children you somehow always get in reflection mode. I justed wanted to share a little bit about Hilary and her birthday weekend. We had a wonderful grilled pizza dinner Saturday night and a fluffy lemon cheesecake for dessert (recipe on that one later). Plus, Travel Man made it home for one night to celebrate with us. Yay!! Sunday was Hil’s actual birthday, not the fake one from the celebration the night before, that’s what Evan would call it. So when we got up on Sunday morning we decided to go to Disneyland for a few hours and have some lunch. It was a gorgeous Southern California day. Sunny and about 90 degrees by the time we got to Anaheim. 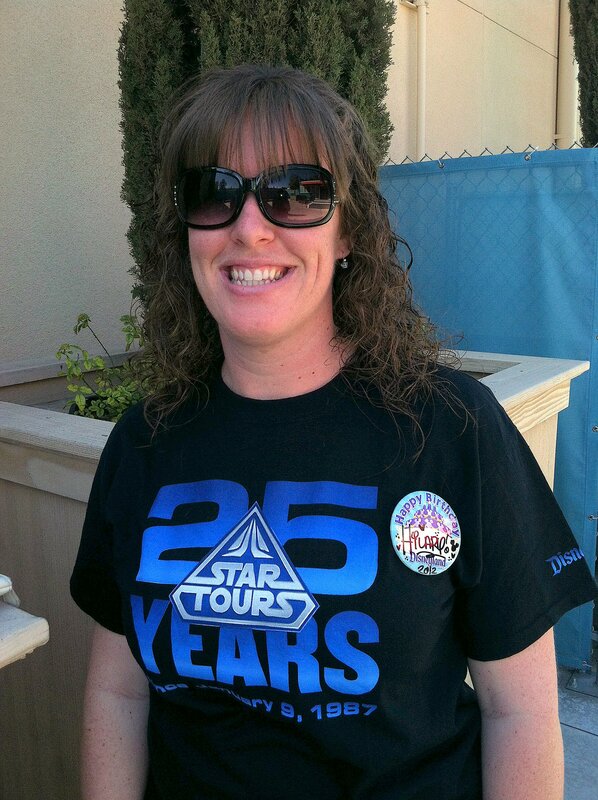 So, we’re standing in line for the Toy Story Mania ride and Hil’s, Auntie Laura calls to wish her a Happy Birthday. After that, and mind you we are still in line for the ride, we start reminiscing a little more about the day Hil was born. I told Hilary that when we got the hospital bill for her, we were charged for a circumcision (! ), and of courses I had to call the hospital and tell them we had a girl. I so clearly remember the billing office person telling me, “Oh my gosh the doctor has her marked down as a boy!”. I still laugh to this day when I tell that story. Hil was cracking up when I told her this one today!! Also I remember Hil’s big sister Naomi and her Aunt Jan sneaking me some homemade Chinese food into the hospital soon after Hil was born, Naomi thought it was so cool to be sneaking the yumminess into me. When I was on the phone with my sister this afternoon she reminded me about coming into the hospital to see me after Hil was born, and she says to me ,”Yo Adrienne, I can’t believe you done dis!!!”. Such good memories, such a great family. We are so lucky. This entry was posted in Around the House, Family and tagged 25, aunties, birthday, celebration, daughter, family, fluffy lemon, grilled pizza, lemon cheesecake, memories, sister naomi, sisters, travel, vacation. Bookmark the permalink.